Flyers forwards Scott Laughton and Oskar Lindblom go after the puck against Colorado Avalanche goaltender Semyon Varlamov and defenseman Ian Cole (right) during the first-period Monday. So much for the Flyers building momentum from their workmanlike win Saturday over New Jersey. The Flyers, their special teams still struggling, dropped a 4-1 decision Monday to speedy Colorado at the Wells Fargo Center. The Flyers (4-5) have yet to win back-to-back games this season, and they are 2-3 on home ice. Early in the third period, the Flyers failed to connect on their third power play of the night. Their power play is 1-for-14 over the last five games, and their penalty kill — which is near the bottom of the NHL — allowed the game's first goal. Semyon Varlamov made 37 saves to help Colorado improve to 6-1-2, including two wins over the Flyers. The Flyers, once again, got off to a slow start — and didn't show hellbent urgency until after they fell into a 3-0 hole early in the third period. "We get down and then we dominate the game," center Nolan Patrick said. "That's something we need to do for a full 60 minutes. We can't just wait until we're down to start making a push like that. We're capable of so much more, and we have to figure it out here." With the Flyers trailing, 3-0, Patrick redirected Travis Sanheim's point drive past Varlamov to get the Flyers within two goals with 16 minutes, 34 seconds left in the third period. But Varlamov denied their swarming attack the rest of the game. "Obviously, it took us getting down to kind of come to life," Sanheim said after his team allowed the game's first goal for the eighth time in nine contests. "We have to come out strong, especially in our own building." Colorado Avalanche center Carl Soderberg celebrates teammate left wing Matt Nieto’s second-period goal past Flyers goaltender Brian Elliott. 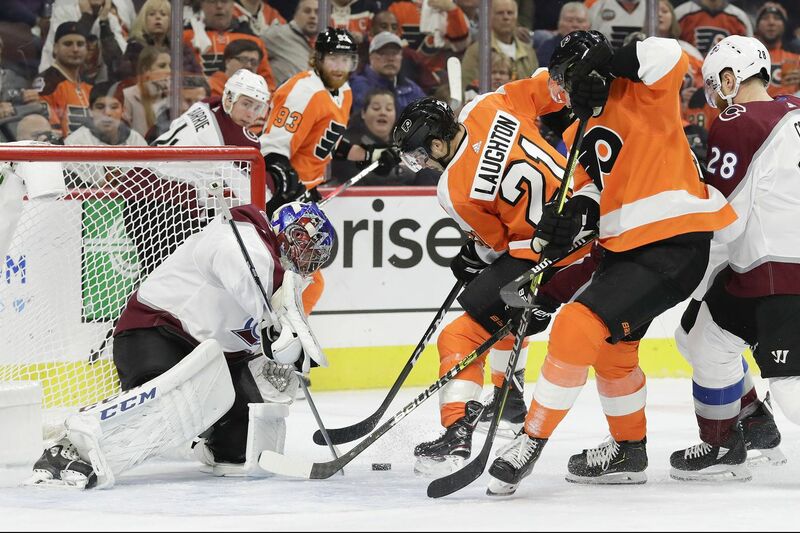 Sixty-one seconds before Patrick's goal, Colorado had taken a 3-0 lead when Claude Giroux fanned on a shot near the Flyers' offensive blue line, and Gabriel Landeskog outraced Robert Hagg and scored on a breakaway. It was Landeskog's seventh goal on the Avalanche's four-game (3-0-1) road trip. Mikko Rantanen later made it 4-1 with an empty-net goal. Colorado's top line scored 12 of its last 14 goals over the last four games – seven by Landeskog, three by Rantanen, and two by Nathan MacKinnon. The Avs aren't getting much secondary scoring, but if their dynamic first line — which badly outplayed the Flyers' top unit — keeps producing at a mind-boggling pace, it may not matter. Colorado's top line showed the way in the first period while on the power play, giving the visitors a 1-0 lead just 3:23 after the opening faceoff. MacKinnon whipped a perfect backhand pass to Rantanen, who scored from the slot. "Coming in, we've got to be more mentally focused and ready to go when the puck drops," Sanheim said. All three Avs first-liners are among the NHL's scoring leaders. "I think they're the top line in the league right now," Hagg said. Jordan Weal was in the penalty box for tripping when Rantanen gave Colorado the early lead. It was Weal's fourth minor penalty in the last two games. The Flyers can't afford being shorthanded. They began the night ranked 29th out of 31 teams on the penalty kill. If it sounds like Groundhog Day, well, it is. They finished 29th last season. #Flyers now 1-4 when they outshoot their opponent. Opposing goalies are badly outplaying Flyers netminders. Colorado made it 2-0 with 5:06 left in the second as Matt Nieto scored from the left circle, near the high slot, after taking a slick pass from Matt Calvert and putting a shot between Brian Elliott's right pads and the post. Hagg's failed outlet pass came back to haunt the Flyers, leading to Nieto's first goal of the season. With 4:15 remaining in the second, Flyers fourth-line left winger Michael Raffl had to be helped off the ice and into the locker room after being hit into the boards by Patrik Nemeth. Raffl could not put any pressure on his left foot. If Raffl can't play Thursday in Boston, Corban Knight will probably take his place. He could also fill his spot on the penalty kill. Elliott (29 saves) and his teammates have no answers for the team's slow starts. "It's not a winning recipe, and that's not how we want to come out," said Elliott, whose team has been outscored by a 12-7 first-period margin. "It just seems to happen and we have to get that turned around."